And the goose is nowhere to be seen, which is fine by me. However I am going to have a go at hare over the holidays. My mother, who suffered a traumatic hare cooking incident more than 40 years ago, the reason that neither of my parents has cooked one since, has stipulated that it will be ordered fully prepared and jointed. Apparently there is a reason that they are cheaper to buy with the skin still on. On a less meaty culinary subject I have made mince pies, as last year I didn't have enough. The Christmas tree is up - actually, it has been up for a week, which is too early,* but if I only put it up this weekend I'd only have it for a week before going away. The tinsel on the stairs is less successful, and needs another attempt. I have five more days left at work before the break, which is both good and terrifying. I was off for two days with a cold this week, which was not great timing. I suppose it is better than having a cold over Christmas, and hopefully it will be mostly gone by then. I have done almost all of my Christmas shopping, so I can relax about that. 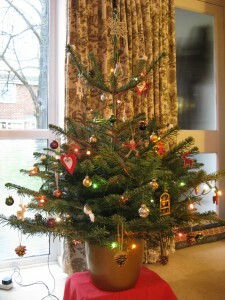 Anyway, here (on LJ...) is the Christmas tree by special request of azdak so she feels less premature with hers! *I have to say it is too early in case people think I don't realise this. This entry was originally posted at http://nineveh-uk.dreamwidth.org/181441.html. Please comment there using OpenID.